Ed Comment: The pictures were added to this article afterwards. The massive Secret Society that is at the heart of the Rennes-le-Chateau story (perhaps "conspiracy" would be a better word)is known as the Priory of Sion. Many identify it with the New World Order of conspiracy theorists, and some say that it was behind the Masonic foundation of America, which they wanted to be the "New Atlantis". This happens to be very close to the truth. The Priory of Sion was said to have created the crusading Knights Templar who supposibly recovered the Ark of the Covenant in the Holy Lands. However, the Priory Documents state that the two orders broke away from one another in 1188, in an event called "Cutting of the Orm". This took place at Gisors, in France. "Orme" is another word for Elm, a sacred tree. Indeed, an important Elm tree at Gisors was destroyed in 1188 during a quarrel between Phillip Augustus and Henry II Plantagenet. Jean Markale believes, as he writes in The Templar Treasure at Gisors, that quarrel was a cover story for the event between the Priory of Sion and the Knights Templar. In a recent issue of Dagoberts Revenge magazine, there was a lenghty article entitled "The Cutting of the Orm: The Golden Age Calendar and the New English Cabala". This article linked the event of the "Cutting of the Orm" to an ancient cataclysm that started a lunar calendar. Indeed, there is more evidence linking the Cutting of the Orm to an ancient cataclysm. Orm, or Orme, seems to close to be coincedence to the name of the founder of the Priory of Sion, named Ormus. When Ormus founded it, it was a gnostic group called the "Sages of Light". Ormus had been converted to Christianity by St. Mark, who appears in alot of the artist Poussin's painting (Poussin was a Priory of Sion grand master). Jean Markale points out that the "Sages of Light" seemed to be based on the Persian "Sons of Light", the so-called descendants from the God of Light Ahura Mazda. 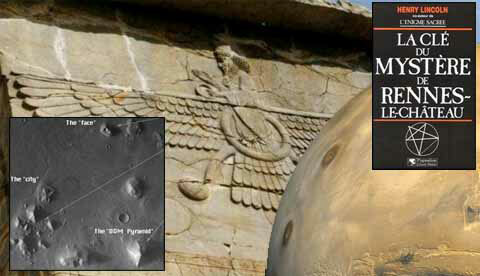 Ahura Mazda was also called Ormuzd! Coincedence? In Priory of Sion documents, the M in Ormus was written as the astrological symbol for Virgo. Both M and Virgo are symbols of Mary Magdalene, who is extremely important to the Priory of Sion. With the M/Virgo dropped from the name of Ormus, we get "Orus", which seems to be a reference to the Egyptian Sun god Horus. Both Osiris and Horus became associated with Jesus, so the name "Ormus" seems to be a fusion of Mary Magdalene and Jesus. According to the Priory's documents, Mary Magdalene and Jesus married and had children, and their bloodline is the Holy Grail. Could this be what is invoked by Ormus? Possibly, but let us not forget that there seems to be a link between Ormus/Orm and an ancient cataclysm. And of course, the Priory of Sion put layers of meanings into their symbolism. Let us jump to the Rennes-le-Chateau mystery. The Priory of Sion was first uncovered through their dealings at Rennes-le-Chateau, the site closely related to Jesus and Mary Magdalene (Leo and Virgo) and the Holy Grail. Perhaps the most famous part of the Rennes-le-Chateau mystery is the massive pentagrams formed in the landscape. The Priory of Sion had shown great interest in the Temple of Solomon, which housed the Ark of the Covenant. Of course, two cherubim appeared on the Ark. I might also point out that Solomon could be literally translated a "Sun-Man" (Sol-Mon), reminding us of Horus and Ahura Mazda/Ormus. The mountain that Solomon built his temple on was called "Moriah", which many linguists say comes from "Meru". Meru was the Cosmic World Mountain of the Hindus. It just so happens that it was five sided, just like the Pentagram and D & M pyramid of Mars! When Solomon built his temple, he called on help from the King of Tyre. Oscar has pointed out that Tyre was sometimes a reference to Mars. The King of Tyre sent Hiram, who is called in Masonic legends Hiram Abiff. His story is parrallel to that of Osiris, whom Horus is an important part of. Many say that the story of Osiris and Set is a representation of an ancient cataclysm! This theory is backed up by Graham Hancock and Robert Bauval in The Mars Myster. “Our TREASURE, that of the PRIORY OF SION, is the SECRET of the BLACK ROCK (‘ROC NOIR’). Ever since two centuries ago when Sir Isaac Newton took a special interest in the sacred geometry of the Great Pyramid, and speculated that its inner labyrinth of tunnels and chambers was a prophecy calendar in stone, a host of scholars who have attempted to elaborate on this idea, and crack the Pyramid's prophetic code. Most significantly, in the Precession of the Equinoxes, the distant Age of Leo 12,000 years ago saw the burial of the Hall of Records beneath the Sphinx's front paws. Recent archaeological and geologic surveys conducted by John Anthony West and Robert Schoch have demonstrated that the Sphinx does indeed date to such a remote time period. Another 6,000 years into the future will complete the Sphinx's prophecy in the distant Age of Scorpio, when perhaps humanity's spiritual evolution will be complete. The flaming wings of the Sphinx may be more than just that of an eagle; they may signify the fire of the Phoenix, the higher form of Scorpio that epitomizes its central themes of death and transfiguration. 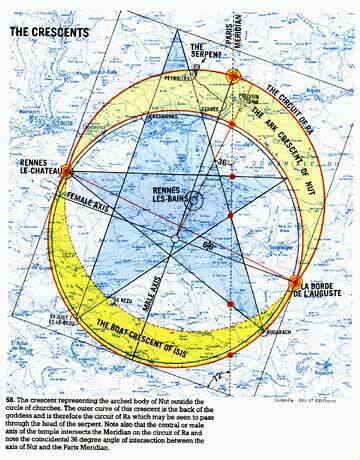 It is striking to note that the Pyramid's time line ending in the 83rd century will also fall in the Age of Scorpio. 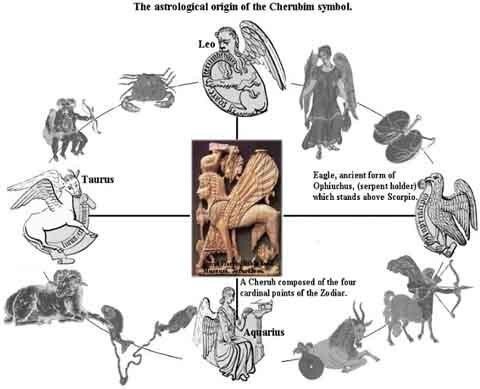 Another theory sees the Sphinx embodying not only the four Fixed signs, but more specific astrological locations which Philip Sedgwick in his book Astrology of Deep Space identifies as the Four Points of Avatar, found at 14 degrees of Leo, Taurus, Aquarius and Scorpio. There are those students of the Egyptian Mysteries who believe that when all Four Points of Avatar will be triggered by planetary configurations, this may be a cosmic key for opening the doorway into the Sphinx's forgotten secrets. When I showed this image to fellow researcher, he informed me that the Cresents where a symbol of the Hall of Records! I'll post more later on how all this ties into the founding of America!